I just read this and I agree with it. 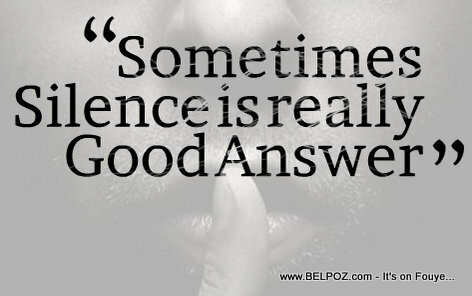 Sometimes, silence is a really good answer. Why bore you? why fill up your email box with news from Haiti that is sad, boring, duplicate and negative? BANM PATAJÉ SA A AVÈK NOU! MWEN KANPÉ AGRÉSIF KONSA A SÉ PA F�'T MWEN, LAVI NOU AN DANJÉ, DÉSIZYONM PRAN LA A SÉ POUM KRAZÉ TÈT TOUT L�'T NASYON KI MÉTÉ AK 5 POUSAN RICHE AYISYEN AN AYITI POU IMILYÉ NOU NAN ZAFÈ MASSIMADI YO A, O NON DE JÉZI. SI PHTK MONTÉ SOU POUVWA A NOU ANTRAVÉ, SÉ YON GWOUP MASISI AK MADIVINÈZ KI KOLÉ TÈT ANSANM AK GOUVERNMAN AMÉRIKEN, KANADA AK LA FRANCE KAP ÉSÉYÉ PRAN KONTW�'L NOU POU FOURÉ NOU NAN CHÈN ÉSKLAVAJ SOU YON L�'T F�'M, YO PA RENMEN PÈP AYISYEN VRÉ, SÉ AYITI YO RENMEN. GADÉ SILANS ÉPI BONDYÉ AP KONBAT POU NOU. ÉKSPÉRYANS PA MWEN, LÈ POU LWA MARYAJ MASISI AK MADIVINÈZ TÉ PASÉ O KANADA, MWEN TÉ GADÉ SILANS, ÉPI LWA LWA MARYAJ MASISI AK MADIVINÈZ LA TÉ PASÉ O KANADA.